The ‘Livinggreen Project’ is an HLF and EU funded initiative to show how heritage assets can be updated to be highly sustainable. It has been implemented in five European cities. Morden Hall Park in South London, with over 750,000 visitors a year, was chosen as the sole UK project. The park is located in the Borough of Merton, and three million people live within a five mile radius. At the heart of the 50 hectare site stands a collection of assets, including a snuff mill and stabling. 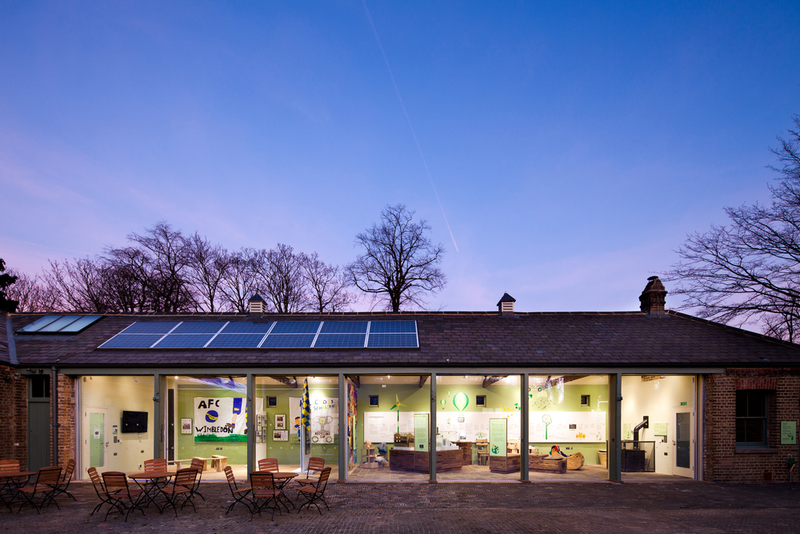 The stable block provides a perfect backdrop for the Livinggreen centre. 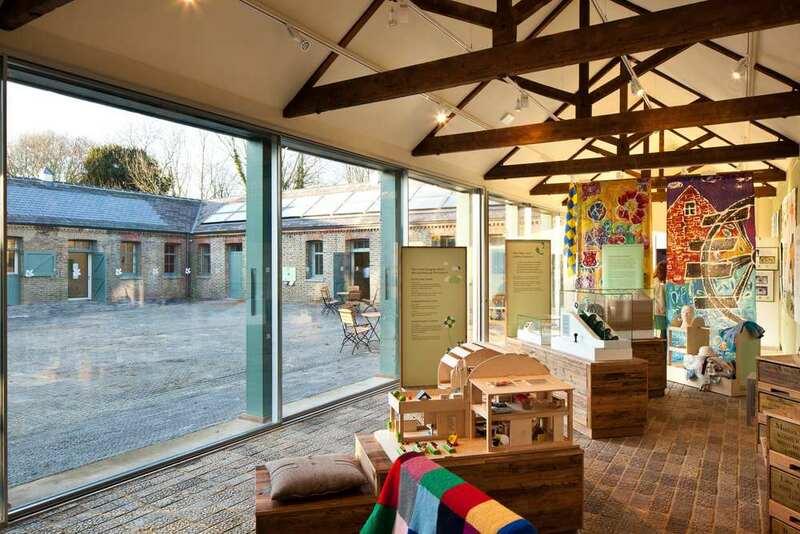 This new centre, which has achieved BREEAM ‘Excellent’, is carbon neutral and energy independent and contains new offices for the estate, a café, craft workshops, a large exhibition space, gallery and WCs. Part of the exhibition space is used to explain the latest technologies used in the project. Energy is generated by solar slates, PV and PVT (Photovoltaic-Thermal) panels on the roofs. An air-source heat pump and a wood-burning stove linked to heat stores (using wood from the park) provide further energy sources. The building is designed to ‘Passivhaus’ standards for insulation, natural ventilation and daylight, minimising energy consumption. The final source of power is to be delivered by the installation of an Archimedes Screw water turbine in the river Wandle, the first in London. The turbine will show how the potential power within comparatively small river courses can be harnessed, continuing the tradition of the Victorian Snuff Mills on the estate. Cutting edge technologies were employed to minimise energy use and heat loss. Insulation materials range form woodfibre, wool and hemp to ‘Spacetherm’. Spacia vacuum glazing, Slimlite units and secondary triple glazing improve the performance of openings. The Design Team was appointed in 2009, and work began on site in 2010 with a detailed online construciton blog and a series of ‘taster days’ during construciton to open up the process to public scrutiny. Morden Hall Park won an RICS award for ‘Design and Innovation’ in 2012.